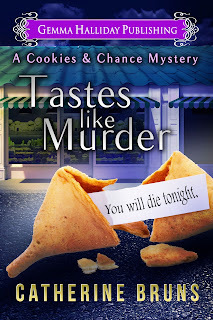 Must Read Mysteries: "Tastes Like Murder" by Catherine Bruns - Excerpt and Giveaway!! "Tastes Like Murder" by Catherine Bruns - Excerpt and Giveaway!! Update: Congratulations to Kathleen Costa, winner of the signed copy of Tastes Like Murder! With divorce papers in hand and her cheating, former spouse in Florida, Sally Muccio has returned to her hometown in the Buffalo, New York region to start a novelty cookie shop with her best friend. All patrons receive a free, homemade fortune cookie with every purchase, accompanied by messages that are strangely foreboding. But there’s no warning when Sal’s ex-husband’s mistress turns up on her front porch one evening...dead. “I wonder if she’ll get a huge crowd at her funeral,” my father mused aloud as he stared at his painting. He was probably wondering if his service would be larger. “Sei pazzo.” Grandma Rosa shook her head. “Poor sweetie.” My mother wrapped her arms around me as I stared, eyes pleading for help, at my grandmother. I put my weary head in my hands. “You didn’t finish telling us what happened.” Gianna refilled her glass. “Will they close the place for a while and call in a forensics team?” Gianna, lawyer-in-training, asked. I ate a small bite of braciole. “I don’t think so. They can’t be sure of the cause of death until the autopsy results come in, so they don’t know if it was an accident or—” I stopped myself, unable to say the word. Grandma Rosa reappeared, setting a cup of espresso in front of me. “Who is this Brian?” Grandma Rosa raised one eyebrow and sat down across from me. “What are you talking about?” Heat rose through my face. “Maybe we should invite him over for dinner.” My mother held the mirror out in front of her while she primped her long hair. It was dark like mine, but not as curly. A small gurgle escaped from my mouth before I could stop it. My mother stood, yawned, and stretched. “I need to get some sleep. I’m showing houses tomorrow morning.” She enjoyed dressing up and wearing her gold-plated name badge as she viewed homes with prospective clients. My parents didn’t need the extra money. Their house was paid off, and my father received a generous pension from the railroad, which was a good thing because in the six months since my mother started her real estate career, she’d made exactly zero in sales. Catherine lives in Upstate New York with a male dominated household that consists of her very patient husband, three sons, two cats and dogs. She has wanted to be a writer since the age of eight when she wrote her own version of Cinderella. Fortunately, Disney never sued. Catherine holds a B.A. and dual major in English and Performing Arts and is a former press release writer and newspaper reporter. 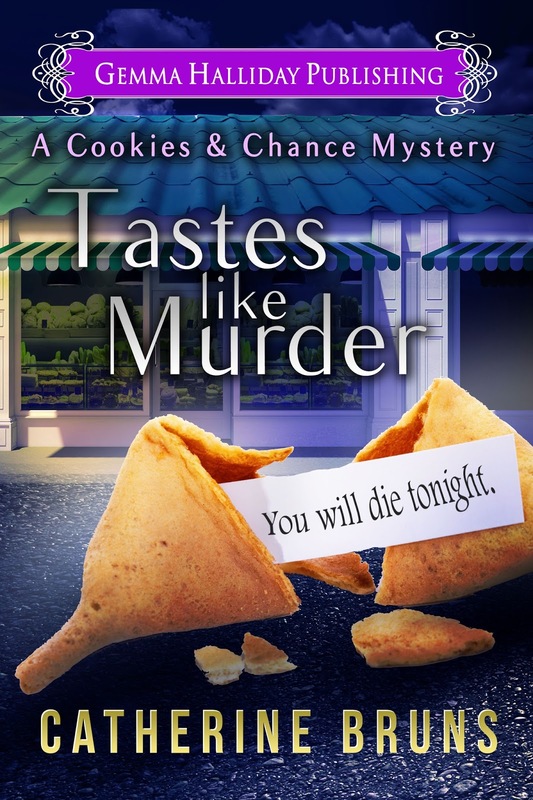 In addition to the Cookies & Chance Mysteries, her Realtor for Hire Mystery series debuts in November with Gemma Halliday Publishing. Please comment below to enter the giveaway! Share this post on social media or follow Catherine on Facebook and/or Twitter for a additional entries. Don't forget to comment and let us know you did so. Please Note: If you are commenting anonymously, please leave your full Facebook name or email address so that we may contact you if you are the winner. Winners will be chosen via random number generator at noon EST on Tuesday, September 15. Congratulations to Kathleen Costa, winner of the signed copy of Tastes Like Murder! Thank you for sharing and for stopping by!! Thank you for sharing!....good luck! Thank you for entering.....good luck! Already follow Catherine on Facebook and Twitter. Thank you for sharing Peggy!! Great post. Sounds like a new series to try. Thanks for the chance to win. Would love to read this, thanks for the chance! Sounds like a great series. Read above paragraphs. Always looking for a new Author to add to my list. Thanks for this chance to win an autographed book. Can never have enough books. Thank you for reading the excerpt, and good luck! Thank you for sharing Kathleen!! Would love to win. Thanks for the chance. janngrogan@yahoo.com. Sounds like a fun read! On my wish list in case I don't win. This sounds like a fun read. I welcome the chance to learn about new books and the chance to win them. Thanks. Good luck...and thank you for dropping by the blog! I am always on the lookout for a new series! Thanks for the opportunity!